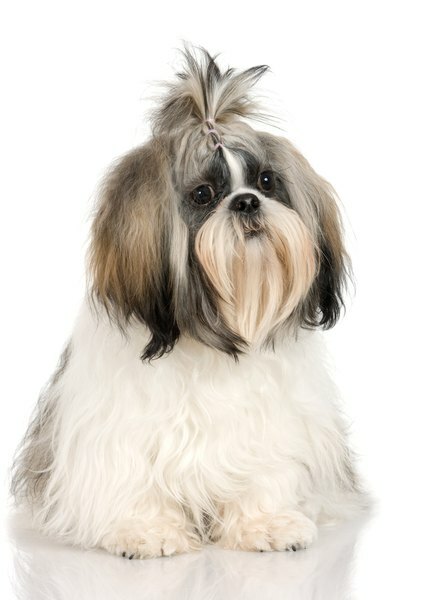 The top knot is a common hairstyle for shih tzus. One of the distinctive traits of the shih tzu breed is its long, flowing coat of hair. Although beautiful when properly maintained, so much hair requires a lot of maintenance. Fortunately, there is a wide range of options for styling your shih tzu's coat, including short haircuts that can give you a break from all that brushing and give your dog some relief during hot summer months. One option is to leave your shih tzu's coat long and full, with the hair on top of the head parted and brushed to the sides to keep it out of the dog's eyes. An alternative is to trim the hair on the dogs face and head, leaving it long everywhere else. This style requires daily brushing and combing to remove mats and keep the coat sleek and silky, and it may become uncomfortable for the dog during warmer months. Another option for keeping hair out of your dog's face, if you choose to keep her coat long, is to tie her hair up in a knot on top of her head. A casual top knot, for non-show dogs, is relatively simple. Part the hair from the ears and the top of the snout and comb it back from the eyes. Make a second part along the top of the dog's skull, from ear to ear, and comb the hair forward and secure it with a small band. Make a third part along the base of the skull, comb out this section and secure it with another band. If you like, tie a bow to the first section before using a third band to secure both sections together on top of the dog's head. For show dogs, the preferred top knot style is a bit more extravagant. After parting the first section around the eyes as described above, lightly tease this section with a comb before combing it straight up, smoothing out the front, and securing it about three-fourths of an inch above the top of the head. Grab a few hairs from the center of the knot and gently pull them up from the center of the band to increase the size of the pouf. Do the same with the back section before securing the two sections together. Use a small curling iron to curl the top knot in small sections, then comb through it and tease as necessary to create a poufy look. The pet clip, also known as the puppy cut or the teddy bear cut, is generally preferred for non-show dogs, since it requires less maintenance and seems to be more comfortable for the dog. For this type of cut, the hair is clipped short all over the body and face, and kept longer on the ears and tail. During hot months, you can take it one step further and shave the hair really short on the face and body. 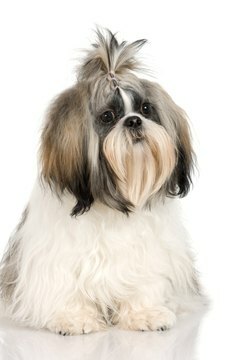 Some shih tzu owners prefer to shave the body but leave the hair on the face long, for a lion-like effect. Whatever length you decide to cut your shih tzu's hair, apart from show dogs there is no standard length and it generally comes down to what you think looks the cutest while making your dog the most comfortable and happy. American Shih Tzu Club: Should My Pet Shih Tzu Have A Haircut?